Recently, my 3-year-old’s behavior became an issue, to say the least. I am currently a stay-at-home/work-at-home mom. The moment my husband and the big kids would head out to work and school, my sweet three-year-old transformed into a defiant, contrary, destructive, and mood-swinging little companion for me for the rest of the morning. Having two actual teenagers and one tween in the house, it is painfully clear to me why the term “threenager” exists! I have dealt with 3-year-old behavior issues before, of course, given that little O is my fifth kiddo to hit this milestone age. But boy, was this kid on a mission to push mama’s buttons! It was the same thing every day. I’d say things like “Why don’t you play with your cars or your blocks?” “How ’bout you play with your playdough?” “Let’s get out your crayons and you can make Daddy a picture for when he gets home.” All of these and other appropriate activities were at our disposal every day, but my contrary little threenager replied “No, no, no” to all of my enticing suggestions and engaging activity ideas. Given the fact that things usually turn around for the better when he is given a job to do, it occurred to me that perhaps he needed to be given a specific activity to do. But not directly from me, of course, since my suggestions were getting us nowhere. We needed a visual schedule. A visual schedule is really just what it sounds like. It is a series of pictures that each represent an event in the daily routine. The pictures are put in the order that the events occur during the day. My experience with visual schedules is primarily from my work with preschoolers with special needs in a classroom setting. Children who have difficulty with transitioning between activities or who have auditory comprehension problems benefit from a visual schedule because it gives them a tangible, visual way to follow along with the day. By looking at the visual schedule, they understand what will come next, making it easier for them to move on to the next activity. 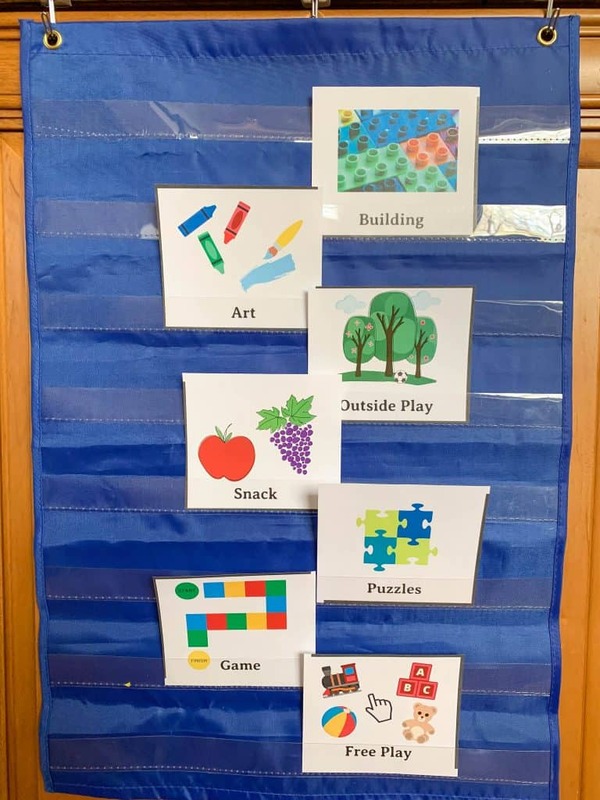 Like many, many things that benefit children who have special needs, visual schedules are also great for typically developing kids. I’ve used visual schedules in the past to help my kids develop good, habitual routines for parts of their day. For instance, when my oldest daughter started kindergarten, I created a visual schedule for her that walked her through her new morning routine. Or when my toddler was rebelling against his bedtime routine. A visual schedule worked wonders. In the case of my firecracker of a three-year-old, a visual schedule gave me a way to direct the course of his morning without ME being the one who actually gave him the direction. The problem with me giving him direction, in case it isn’t obvious, is that he naturally wants to do the opposite of anything I suggest in order to exert his independence. Totally normal, but no doubt a frustration for any parent. By using a visual schedule, the schedule is what is directing the activities, not me. The first thing I did was take an assessment of the natural course of a typical day for us. Here’s what our typical day looks like, if we don’t have any errands to run and we are home for the day. Times are rough estimates…I do not follow a strict daily schedule for my 3-year-old by any means, but the order of events is very consistent. 7:30 Otis stays with Daddy while I take the big kids to bus stops. 8:30 O and I take the high schooler to school. 9:00-11:00 The holy battle of wits ensues between Otis and I. I attempt to get chores and work done. He attempts to find creative ways to make me lose my cool. 11:00 We eat lunch together. 1:30 or 2:00pm He wakes up and has a snack. 2:15-3:00 More battles transpire, though usually not as spirited as the morning round. 3:00-5:30 The big kids are home from school. We often have orthodontist appointments, school basketball games, or kids to shuttle. If we’re at home, O usually plays outside or in his siblings rooms. Peace & tranquility reign for the most part. 6:00 Dinner as a family. As you can see, there is a chunk of time in the morning and an hour or so in the afternoon that are our main times for difficult behavior. Your times might be different depending on your daily schedule. Those are the times we are targeting here today with a visual schedule. Plot out your rough daily schedule at home with your three-year-old and see what chunks of time are really an issue for you. Next, make a list of all the different activities you have available at your home for your three-year-old to do. I like to keep most of these categories pretty broad so that there is room for some flexibility within the schedule. For example, “art” is one of my cards. Art might be watercolor painting, finger painting, drawing, coloring, or doing a craft. “Outside Play” might be climbing on a playset, playing catch, exploring, etc. I also included a few essential tasks, like “get dressed” and “eat breakfast” for those days when he needs a little more direction through his morning routine. I created my visual schedule cards using the free version of Canva. Canva has a lot of free icons, illustrations, and photos available to use. I simply made a list of all of the preschool activities we do at home that I wanted to have available to put into my 3-year-old’s daily schedule. Then, I searched for those things in Canva. I like to also have the written word beneath the picture since preschoolers are pre-emergent readers. Exposing them to text in association with the visual concept can help them learn to read the word. Canva easily allows you to add text beneath each picture. Another option is to simply draw your own pictures on some index cards. It really doesn’t have to be fancy. 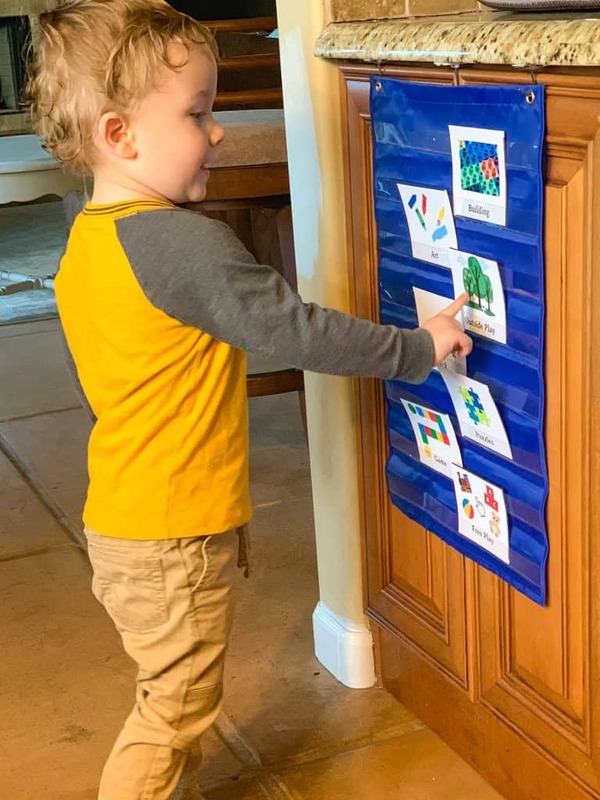 You also need a place and method for displaying the schedule for your 3-year-old. Because I’ve worked in elementary schools, I have a stash of supplies for posting charts and schedules. I use a pocket chart very much like this one to put my visual schedule cards into. The pocket chart is mounted on the side of my lower kitchen cabinet Command Strip hooks. You could easily tape your activity cards to your wall in order, or use a cork board. You can laminate them and add velcro to the back, allowing them to stick to a felt board. Really, there are a bunch of ways to display the schedule and none is better than any other. The important things are that you place the cards in the order that you want and that the schedule is somewhere low so that your 3-year-old can see it easily. For my 3-year-old, we use a timer for computer time. It’s a relatively new activity for him and he sits on my lap while we play educational games on pbskids.org together. But I like to limit it to 10 minutes, so we use a timer. It really helps him let go of the activity and move on when the time’s up. The only “set in stone” part of this visual schedule is that there will be a schedule sequence to follow. The point of having a customizable visual schedule is that each day can and should vary. For instance, if I have a work deadline I’m working on, I will probably fill most of the schedule with things that are mostly self-directed activities once I get him started. On the other hand, if I do not have much on my own to-do list for the day, I’ll try to incorporate things like “play a game” and “go for a walk” into the schedule, so that I will be more involved in my little guy’s activities. The point is, his schedule is whatever I make it on any given day. Get your schedule ready the night before, if possible. Look at what’s on your plate for the next day, and decide how much you can participate in a hands-on way in those target hours with your 3-year-old. Choose the activities accordingly. I like to break up the morning with a couple activities that directly involve me, like reading stories or playing a game. It gives me a break from adulting, and gives my 3-year-old a break from playing on his own. By establishing a semi-structured part of your three-year-old’s day during your most difficult hours with him or her, you can help keep him or her occupied in a healthy, educational way without having to resort to screen time as a quick fix. 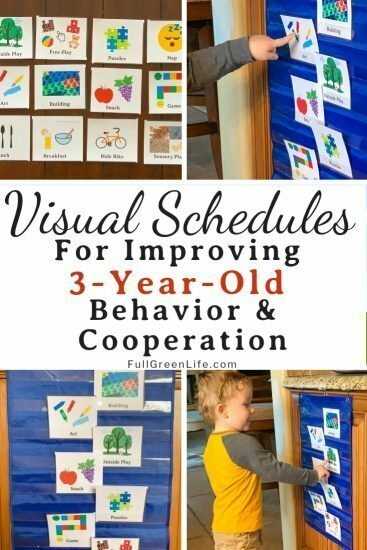 I have found that since implementing the visual schedule with my own 3-year-old, his challenging behavior has improved a ton. He looks forward to his “schedule time” and follows along willingly and cooperatively. This feels like nothing short of a miracle to me, but the solution was actually so simple! If you’d like to use the cards that I created for my schedule, just sign up with your email below and I’ll send you the downloadable PDF that you can then print out!